12-May-2011 -- To avoid intruding on private property too much, I tried to stay to the west and north of the houses that fronted the main road. Nonetheless, the confluence point ends up being just behind someone's shed, on a hillside that they're using as a junk pile. 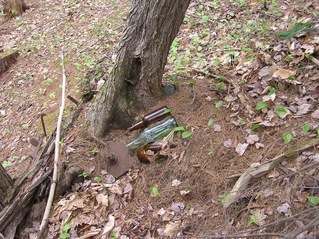 A cluster of (soda and beer) bottles (one of them broken) marks the confluence point - probably unintentionally.